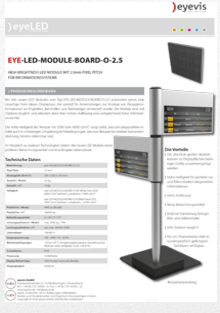 With the newly developed LED module EYE-LED-MODULE-BOARD-O-2.5, eyevis presents an innovative type of LED display technology especially designed for applications in passenger information systems at airports, railway stations, and other passenger hubs. The modules are fully outdoor-capable and enable a high density of information thanks to the high pixel resolution of the modules. The outstanding brightness of the modules of 2500 or 6000 cd/m2 allows best recognition and readability of displayed information even in difficult ambient light conditions like in direct sunlight exposed places. Compared with other display technologies, eyevis’ new LED modules offer wider viewing angles and longer lifetime.